It seems to be a more or less normal family, apart from the fact that Takuya as the son seems to be more mature than his father, and maybe their house is a bit exaggerated. When Takuya falls into a coma after an accident, his dad answers his mobile and talks to Hikari, Takuyas girlfriend, and a weird story begins. 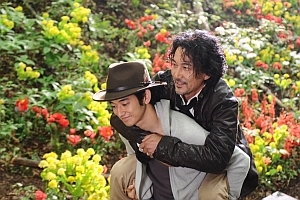 Koji YAKUSHO’s directing debut tells a story about a very unusual but alleviating way of mourning. World sales: Phantom Films Co Ltd.
About the director: Koji YAKUSHO, born in 1956 in Isahaya, had his international breakthrough as an actor in 1997 with Masayuki SUO's SHALL WE DANCE?. As early as 1989 he received his first Japanese Academy Award for UNDER AURORA. International awards soon followed for THE CURE, PARADISE LOST and THE EEL. TOAD's OIL is his directorial debut.